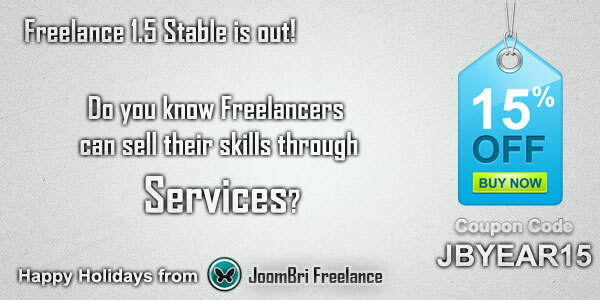 JoomBri Freelance v1.5 Stable Released! We have also included Service Progress Update page where Sellers or Freelancers can update the progress of their work and Buyers can keep track of it. This feature gives site owners an extra income from Service Fees and Commission. You can buy or renew your license with 15% OFF on all our licences by using the discount coupon JBYEAR15 which is valid until 1 January, 2015. Please do not miss this opportunity. We wish you Happy New Year 2015! Download link - Click Here [visible only to members with active license]. Please take a back up of your site before upgrading. If you have modified the source code or CSS files, take a back up of the files as they would be replaced with the new version. Click here for upgrade instructions. JoomBri Freelance v1.3.x Stable is the last version for Joomla 2.5 and starting from v1.4 our development will be for Joomla 3 and above only. Copyright © 2012 - 2014 BriTech Solutions. All rights reserved. To unsubscribe, Click here and change your Notification Preferences.